For this edition of 5 Questions With…we caught up with one of SYNC’s longest pals, British photographer Patrick Fraser. 1. Patrick, when did you make the trek over here to the US, and what made you take the plunge? 14 years ago! I was looking for adventure and a change in lifestyle. 2. How does the photography industry differ from here to England? Production here is bigger and I would say the budgets are as well – its a much larger country after all. The creative in the UK is more risk taking – here is a bit safer in advertising. 3. It appears you have been shooting motion cameras too. Can you see yourself completely migrating into that medium? I have been working in motion picture the whole time I have been out here! I just directed my first commercial for Nissan but I’ve been DP on spots and music video’s for a while now. It is interesting now DSLR’s has changed the whole industry and photographers are becoming filmmakers. I will always be primarily a stills photographer but I’m definately excited by motion picture and where that will take me and where I will take it. 4. We hear you are quite the cook. What are some favorite dishes you like to whip up? 5. What was one of your most memorable shoots to work on? 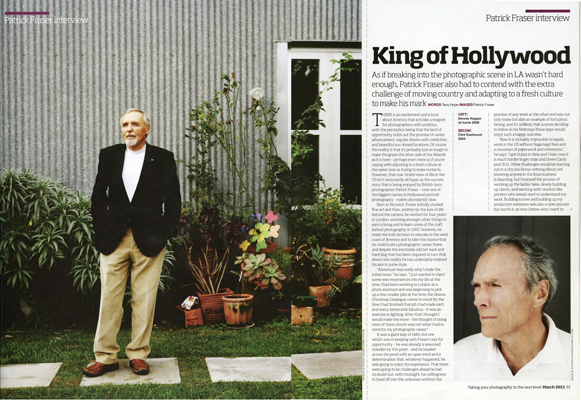 One that comes to mind was shooting the late Dennis Hopper at his home in Venice. Check out more of Patrick’s work here!